One of my great regrets from the years that I spent working in a professional kitchen is that I didn't very often take the time to write down exact recipes. Most of the "recipes" from my line cook days are nothing more than a list of ingredients (often with no amounts). If I'm lucky, I will discover that I wrote down a few cursory words to indicate method and order. I just never thought I would ever forget how to make so many things. I made them over and over...day after day...until I could make them in my sleep. How could I forget? Such is the optimism of youth. Occasionally I will get a bee in my bonnet to reproduce something I remember making. I will spend a little time rooting through my files (to see what I actually wrote down)....and I will poke around on line...and thumb through my cookbooks. I almost never manage to replicate a dish exactly. But I almost always end up with something delicious...as well as a renewed appreciation for a particular preparation. Caponata is one of these things. I made it regularly for a while when I was the sauté cook (I think it accompanied Swordfish...but I'm really not sure at this point). If you are not familiar with Caponata, it is a Sicilian eggplant preparation. I remembered the one we made at the restaurant as being very simple, containing nothing more than eggplant, onions, celery, capers and olives (and olive oil for sautéing). I love Mediterranean eggplant dishes...and the salty and tangy aspect of this one appealed to me very much. In the years since, every time I have run across caponata, I have noted that it contains tomato. This seemed "wrong" to me, but I didn't think too much about it because with all the wonderful eggplant dishes out there, I never had a particular reason to stop and sort out if my memory was faulty...or if there were 'authentic' versions of caponata that did not include tomato. 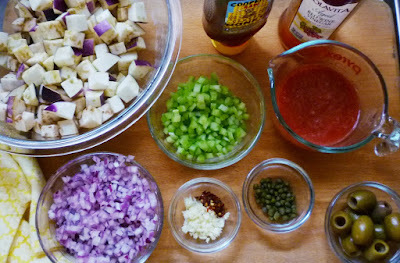 Recently, however, I needed to prepare caponata for a client, so I began to look into it. I discovered I actually had a recipe of sorts in my files from my restaurant days. It did not include any tomato. And as luck would have it, it was one of those bare bones recipes I alluded to above. So I at least had a starting point. Sweat onion and celery 'til just translucent. Add eggplant and cook 'til it just cooked through. Pull off heat and toss in olives and capers. Season to taste with Salt & pepper. Do not overcook. As always, I began to look around at other recipes. And, as I did, I found that one of the essentials in caponata does happen to be tomato. Furthermore, one of the hallmarks of the dish is its sweet/sour counterpoint (agrodolce)...which the recipe of my notes definitely lacks. I can only assume that the remainder of the dish I made at the restaurant included the other essential elements, and that the 'caponata' I was making at the time had been deconstructed on the plate in some way. The caponata I finally made for my clients did draw heavily on my old notes in the sense that I kept the ratios of eggplant to onion to celery. I also included both capers and olives...not all recipes do this (most include one or the other). Some recipes add raisins and pine nuts. I didn't add either of these...but think they would be delicious. Besides my old restaurant 'recipe', I relied on David Lebovitz's version, as well as an excellent caponata basics post at Food 52. The comments in the Food 52 post are particularly helpful when it comes to finishing the dish and getting the balance just right. 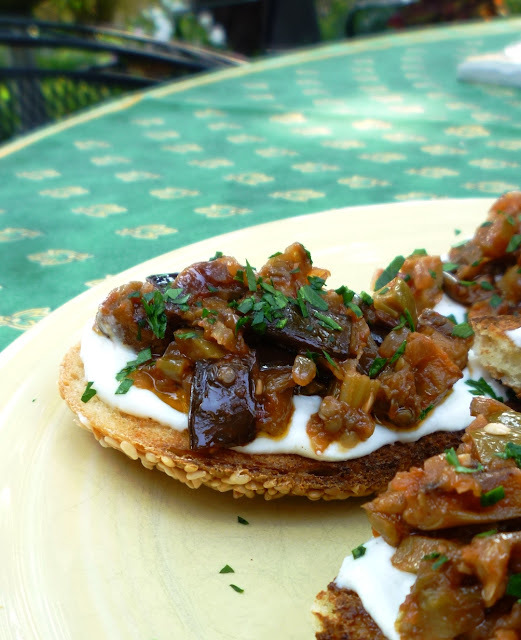 The author says that the caponata should taste "very savory" and be "slightly acidic and subtly sweet." To achieve this result, add salt, vinegar and/or honey as necessary. 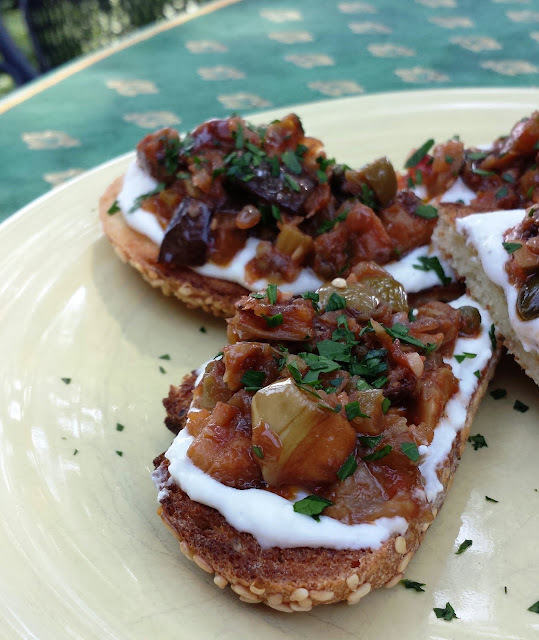 I served the caponata to my clients on ricotta smeared crostini as a passed appetizer. 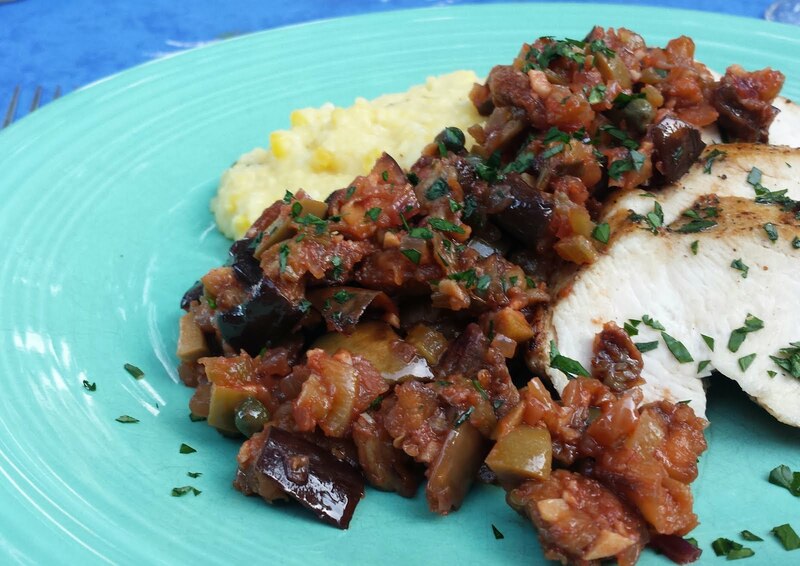 I loved the caponata I made so much that I made some for myself the very next day. 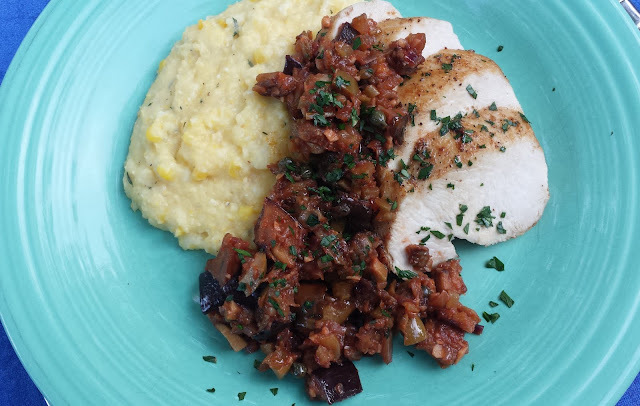 We enjoyed it for dinner with some sweet corn polenta and a sautéed chicken breast. I had some of the leftovers the same way my clients did...and then the last of the leftovers on the leftover polenta (now firm...and fried until crisp). It was delicious every way I served it....and as others have noted, the flavor improves upon sitting and as good as it is the day it is made, it is even better on the second and third days. Place the eggplant in a large bowl, season with salt & pepper and drizzle with 3 T. olive oil. Toss to coat well, adding more oil if necessary. Spread on a rimmed baking sheet (half sheet pan) that has been sprayed with pan spray. Make sure the eggplant is in a snug single layer. Place in a 450° to 475° oven and roast until tender and golden—about 25 to 30 minutes. Turn the eggplant over—using a pancake turner or other wide spatula—after it has been in the oven about 20 minutes. Set aside. Meanwhile, warm the remaining 3 T. of olive oil in a wide sauté pan set over moderate heat. 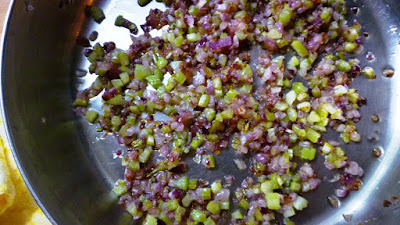 Add the onion and celery along with a good pinch of salt and cook until tender (the celery will still have texture, but it shouldn't be crunchy) and beginning to caramelize—about 20 to 25 minutes. While the vegetables cook, purée the tomatoes (along with their juices) until smooth. When the onion and celery are tender and caramelized, add the garlic and pepper flakes and cook until fragrant. Add the tomato purée, increase the heat, and simmer until the tomato sauce is very thick (it should not be soupy). Add the olives, capers, vinegar and honey and bring back to a simmer. Fold in the roasted eggplant. Smooth the caponata out into an even layer and let simmer very gently for five minutes or so to allow the flavors to blend (if it seems very dry, drizzle some hot water in around the edges. Taste, correct the seasoning with salt and the sweet/sour balance with honey and vinegar. Let cool to room temperature. Serve as a side...or a spread for crostini...sprinkled with parsley, basil or mint. Serves 6 as a side dish and 8 to 12 as an appetizer. Notes: If you don't have vine ripened tomatoes...or don’t want to peel and seed any...simply whisk a 1 1/2 T. of double concentrated tomato paste into a cup of water and add as you would the tomato purée.